Secular Pro-Life Perspectives: Are viruses "alive?" The fetus is a living human organism. This is where viruses make everything more complicated. They are basically strings of RNA or DNA in a small hull and need cells to do something. 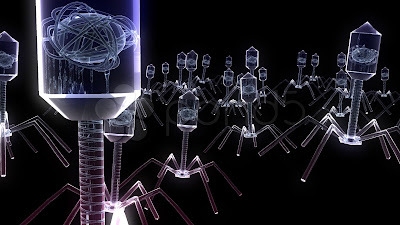 We’re not sure if they count as living or dead, and still there are 225M cubic meters of viruses on Earth. They don’t seem to care what we think of them. The video doesn’t offer a definitive answer, only (fascinating) questions to ponder. But in terms of the abortion debate, this response is hardly the “gotcha!” argument some pro-choice people seem to think it is. The fetus is a living human organism just as you and I are living human organisms. If we can’t know whether living human organisms are “really” alive because of deeply philosophical questions about viruses and the earth and aliens and AI, then we can’t know if you and I are “really” alive. Just like the fetus, we too are organisms made up of living cells that are made up of non-living microscopic machines. We don’t have to know if a human is “alive” in order to assert that human’s rights. The pro-choice person is asserting the right to an abortion even though the same person doesn’t seem sure whether the women seeking abortion are “alive” (since the pro-choice person isn’t sure what “alive” means in the first place). Uncertainty about whether a human is “alive” is not justification for killing that human. The pro-choice person is not (we hope) arguing that it’s okay to kill anyone at any time since we don’t really know what “alive” means. B. Explain why these questions about “life” are profound only when it comes to the fetus and irrelevant when it comes to born humans. I strongly suspect this route will just lead us back to Reaction 2 above, but if anyone knows of a different response, I’d be curious to hear it. In any case, when I say that the fetus is a living human organism, I am not implying that biology has answered all of life’s mysteries. I’m explaining that—to the extent you and I are biologically “alive”—so is the fetus. This statement is not a pro-life belief; it’s a long-standing well-established biological fact, and in stating it pro-lifers aren’t “twisting science” any more than are the countless biology and embryology texts which have explained for decades that, as organisms, we humans begin as zygotes. The pro-choice people who are firm in their stance don’t tend to have a problem with this concept, because they believe merely being a living biological human is not enough to merit human rights. That’s fine—that’s a worthy discussion which we’ve tackled before (see above links). But I’ve long suspected that many pro-choice people are not nearly so confident in their position. How fragile does your view have to be if it only works as long as we can't really know if anything at all is "alive"? "Viruses may or may not be 'alive,' so abortion is probably fine I guess."